i have been planning this post from sometime now and i must admit collecting ColorShow nail polishes is quite addictive.. i have to keep reminding myself that i don't need any more nail polishes but these babies are really cute and eye-catching.. Except Dine & Wine and Crazy Berry i haven't worn any other shade till now(applied just for the swatches for 2 mins) but i still keep buying more... so for now these are the shades i own..
Its a very sheer nail polish , reminds me of strawberry sauce only difference it has silver glitter in it. In the swatch below i have applied 3 coats. It has a decent staying power less than the matte ones but stays on for roughly 3-4 days without chipping. This is one of my most favorite shade in this collection, its a beautiful coffee brown shade with copper-ish glitters , looks good on all skin-tones, staying power same as Velvet wine , again goes on very sheer in the first coat and looks best after 2-3 coats. A must have orange nail polish , for me its a perfect orange shade goes opaque in two coats. Have nothing else to say for this shade as the shades speaks for itself. I can wear red nail polish through out the year, Keep-up-the-flame is gorgeous olive undertone red shade, again you need atleast two coats to make it look even and opaque. Constant Candy is a pale pink , the consistency is thick enough to provide complete coverage in two coats. 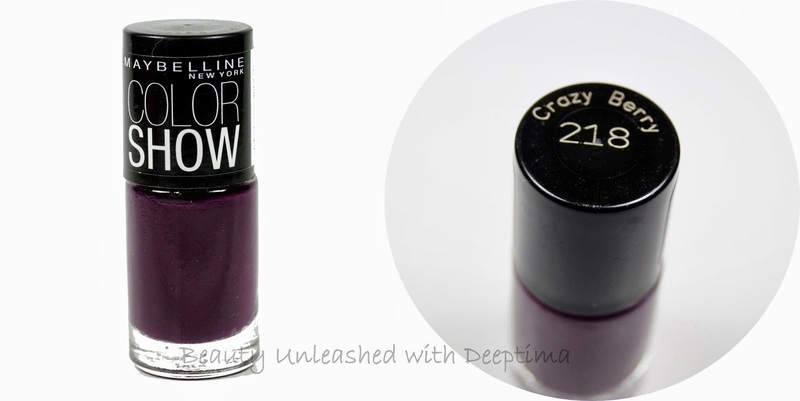 I can see myself wearing this shade a lot in winters. I love bright pink nail polishes Hooked-on-pink is a bright fuchsia pink shade and i absolutely LOVE it, a beautiful bright shade which will compliment all skin-tones. Out of all the shades i have this one had the best coverage, in the picture below i have just applied one coat of this shade. Ever since i saw this shade on the posters of ColorShow at Maybelline counters i fell in love with this shade, getting my hands on this shade was not easy.. it shades screams gothic and Halloween to me, the shade looks little bit deeper and darker in real. Available at all Maybelline counters. I hope you find the swatches useful and i would love to know your favorite shade !! they are really pretty pretty !! Love your clicks :) n Hooked on pink looks great. Btw were u wearing wine n dine the other day? Constant candy is a gorgeous shade....will definitely get one. Thanks for the stunning review sweetheart. and the pictures have come out beautiful.